From 1884 through to today, Guelph’s labour community has gathered to support the strength of labour power, to defend workers around our region, and to support the radical values of working people—a just share in the fruits of our labour, safety in the workplace, social justice, environmental protection, and worker power. We stand with all those in our community facing injustice and struggling for a better world. 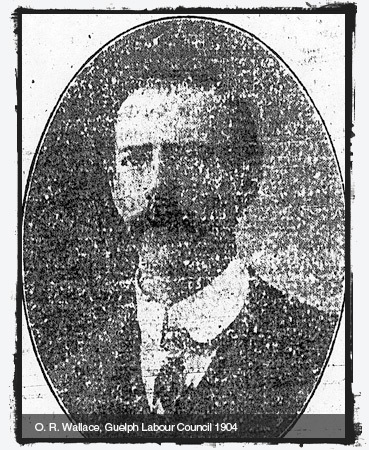 On December 23, 1897, Mr. J. O’Donohue of the Toronto Trade and Labour Council (TTLC), spoke to Guelph workers assembled in the Knights of Labour Hall. The meeting, held under the auspices of the Organ and Piano Makers’ Union, ran one hour and several minutes before it broke up for discussion. 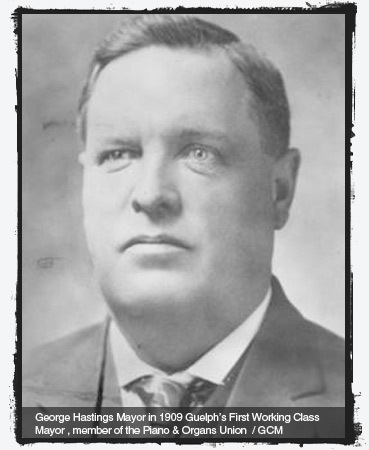 In his speech, O’Donohue stressed the need for workers to organize. As a result, further meetings between Guelph workers and union men took place and, in 1898, the Guelph Trade and Labour Council (GTLC) was formed. This was not the first incarnation. That had occurred in 1884. It was also not the last. This vanished with workers only to try again in 1889. This second attempt by the Knights of Labor (KoL), also failed necessitating the 1897 one. This one proved to be the one that took. The first President, E.J. Corman, conceived the basic characteristics of the GTLC in its intent to become an integral part of the community. He also established the basic pattern of interrelations between the Labour Council and the local unions. Corman, an active participant in his union, the Iron Moulders Union, one of the earliest Internationals to arrive in the area, was able to take Guelph’s small base of 13 unions and help it grow. Besides providing a sounding board for the working class, the GTLC was active in endeavours that ranged from setting up free swimming holes and ice skating rinks for the workers and the poor, to running for various levels of government. The issues were broad, but the concern ran deep, as did the commitment of the individual members. At the start of the 20th century, the GTLC focused on two separate but related areas of concern: direct union matters and municipal-related union matters. In 1902, the membership, under President C. W. Dawson, grew in confidence. The union label advertising campaign was stepped up, and even striking workers outside the community were financially supported. This included the Gurney foundry workers in Toronto. The GTLC eventually persuaded the dealer of Gurney stoves in Guelph, Mr. Rumford, not to accept or sell the product while Gurney workers were on strike. O.R. Wallace, president of Guelph’s Typographical Union, representing the American Federation of Labour (AFL), visited Galt, in 1902, to help its workers set up their own trade and labour council. He was assisted by GTLC President J. Dandeno in this action. At home, the Labour Council argued against bonusing of industries, created a committee to investigate the high price of bread and meat, and sought local solutions to the city’s problems. The year 1902 marked the entry of the GTLC into the “immigrant” fray, always a difficult issue. While Vancouver and British Columbia wrestled with their “Oriental problem”, Guelph unions questioned the city’s policy concerning Italians who were perceived as the “foreign element” who “herd together and contribute nothing.” At the same time, the GTLC felt they should be protected like non-foreign workers, receiving the same wages for the same work. As it was stated in its meeting in 1906, concerning wages: “no discrimination should be made in point of favour of British subjects but that the British subject should be preferred in engaging.” It was a dilemma not easily resolved in the formative days of the labour movement. In 1912 Guelph won the right to host the annual convention of the TLCC. The convention opened on Monday, September 9, 1912, with some 241 accredited candidates in the city. Visitors were given a tour around the city and shown the sights. They attended the speeches and congratulated themselves on the “onward march of international unionism.” According to the Industrial Banner, Guelph’s convention, the twentieth held by the TLCC, broke all previous records for attendance. The event, the first and only to be held in Guelph, was a success. It also marked the coming of age of the Labour Council. The Ontario Liberals are privatizing public transit. Voice your opposition and help keep transit public! © 2019 Guelph District Labour Council. All rights reserved.